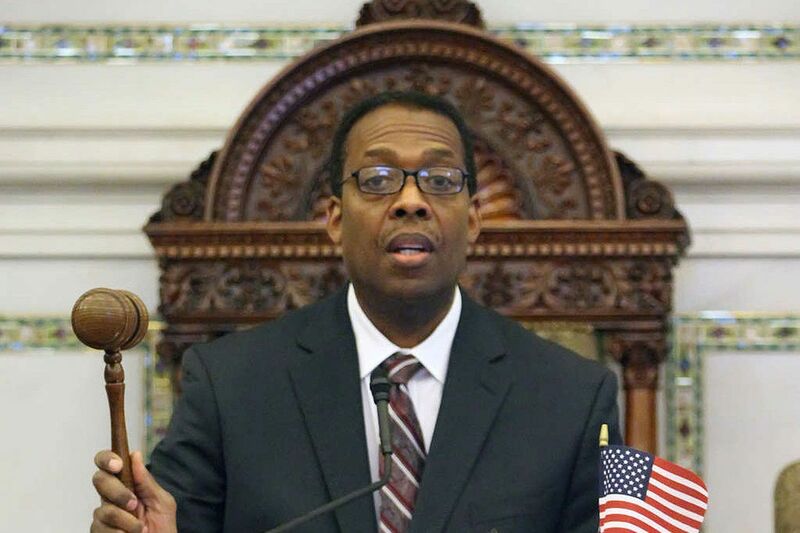 Council President Darrell L. Clarke. Abdul-Aliy Muhammad was arrested at City Hall last week protesting a policy that even engaged voters with urban planning degrees might struggle to define. Muhammad’s group, the Black and Brown Workers Cooperative, has marched against police brutality and racism in the Gayborhood, and for such issues as fair work schedules for service employees. It took up councilmanic prerogative because it sees this as directly related to anti-displacement activism in gentrifying neighborhoods. Its members aren’t the only ones. Heading into Philadelphia’s primary season, the issue has been raised in news reports about suspicious land deals and by at least one candidate running for City Council, all while the city halts certain land sales in order to reassess its process. Councilmanic prerogative refers to the unchecked power that the 10 Council members who represent defined geographic parts of the city have over land use in their districts. How much power does a Philadelphia City Council member have? When it comes to how a neighborhood looks, a lot. Council has final say over land-use decisions, including whether to add a bike lane, create a historic district, or sell a vacant parcel of publicly owned land. And it’s not really all of Council. That’s because, by custom, the 16 other members defer to the district representative on issues dealing with his or her turf. Council almost unflinchingly follows its own unwritten rule. A Pew study from 2015 found that of 730 Council votes where prerogative was in play, 726 were unanimous. Critics say giving one legislator that much power makes the system vulnerable to unethical behavior, with developers giving Council members campaign contributions in hopes of favorable decisions down the road. In the six cases where a Council member has been convicted of wrongdoing in Philadelphia over the last 40 years, all have involved land-use deals. 10 district Council members enormous sway over any land-use issues in their districts. Critics say giving that much power to one legislator makes the system vulnerable to unethical behavior. Here are the number of vacant properties in each district. 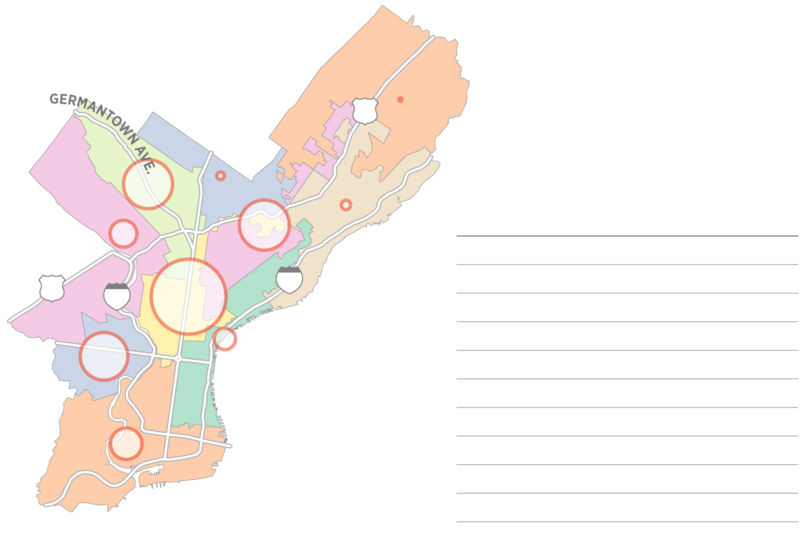 Circles sizes are proportional to the number of vacant properties in each Council district. Just last month, the city halted the sale of most public vacant lots, after the Inquirer reported on real estate developers netting huge profits buying city land at below market rates and flipping it, with the help of district Council members. Council members say district representatives tend to know their neighborhoods best and are closer to constituents. John Carpenter, former deputy executive director of the Land Bank and the Philadelphia Redevelopment Authority, said he’s seen a lot of issues related to sales of vacant land. But to remove prerogative altogether would strip residents of a voice, he said. “For every time you find a thieving, conniving developer who somehow hoodwinked the city into giving them something for free, I think you can find a Council member who listened carefully to neighbors and tried to act accordingly," Carpenter said. Some developers also oppose councilmanic prerogative. Ken Weinstein, a Mount Airy-based developer, said he’s been blocked from buying several parcels of city-owned vacant land because the Vacant Property Review Committee requires a letter of support from a district Council member. Members can also place holds on certain properties. The city said it did not have data on how many “holds” Council members have put on properties or why sales were blocked.
. Leo Addimando, a managing partner of Alterra Property Group and vice president of the Building Industry Association, however, said the authority Council has to introduce legislation is an efficient way to get large projects through. It’s easier to do business when there’s a person in charge of decisions, he said. “In this business, certainty is more important than outcome … so being able to go to a Council person and have a conversation about whether a zoning change is something they’ll support, I think it’s a useful thing in streamlining the development process," Addimando said. Given that councilmanic prerogative isn’t an actual rule, its unclear how one would abolish it. Theoretically, the seven Council members who don’t represent geographic areas could all choose to buck a district lawmaker, but they would still need the votes of at least two district lawmakers who might want the courtesy extended to them. Justin DiBerardinis, a former staffer to Councilwoman María Quiñones-Sánchez and candidate for Council at-large, has proposed restricting councilmanic prerogative. He thinks the city needs a charter convention to more evenly allocate power among the branches of local government: Give Council more control over certain budgetary items, for example, and maybe Council cedes some control over land use. Even he is surprised to be talking about such things in the campaign , though.